Bert Kaempfert’s repertoire includes around 700 original orchestral arrangements. 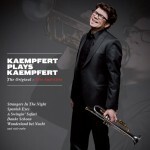 The library, owned by Marion Kaempfert is exclusively performed by the Bert Kaempfert Orchestra, London – from 2011 with Stefan Kaempfert as soloist. For Stefan Kaempfert’s debut album, 18 separate titles and an additional 7 minute Greatest Hits Medley were recorded at Angel Studios in London.